Let's get Festive! Lights, garland & gift tags! THE 2018 PROGRAM IS NO LONER TAKING ORDERS, THANK YOU FOR YOUR INTEREST AND SEE YOU IN 2019! The Holiday decor program is back and is a fantastic way to brighten our business districts. To fund the project, we need businesses and residents to sponsor individual lamp posts. The cost is $150 per pole in the busier districts (Hemingway, Arts District and Pleasant) and $100 per pole in the districts with less foot traffic. 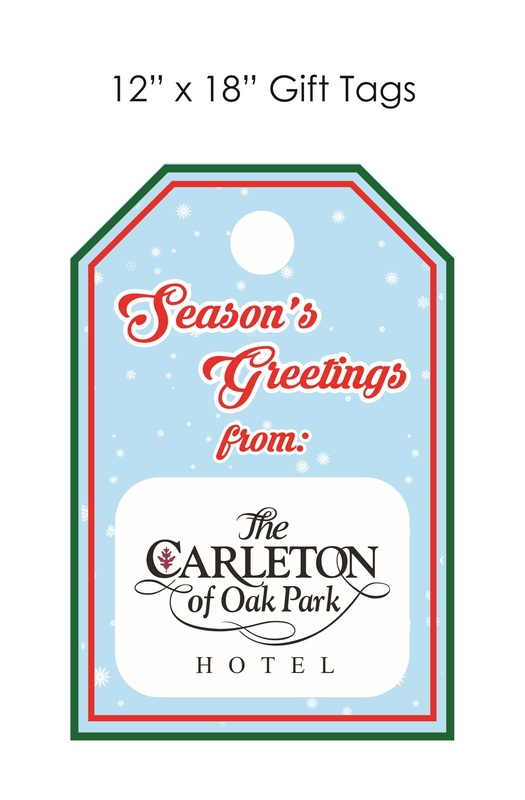 Each sponsored pole will have a decorative, weatherproof "gift tag" sign affixed to it, featuring the sponsor's logo. Businesses within each district will receive priority for purchasing the sponsorships. Contact the Chamber or your Business District leadership. Note: With a generous grant from the Village of Oak Park, the Chamber of Commerce is collaborating with business district leadership and McAdams landscaping to bring you this program. Signage will be weatherproof and affixed with festive red ribbon. The design of the signs will be the same in each district, promoting a uniform look and feel. Each sign will prominently feature the logo of the sponsoring business. Businesses and residents are welcome to purchase as many signs and sponsor as many lamp posts as they choose. Where do I send my logo? Please send a JPG, PDF or PNG to decor@oprfchamber.org. If you have a square logo, that will maximize the space. Let us know by Nov. 26 , so we can create the signs. After then, we'll take additional orders, but the signs won't be available until early December. * Why just these ones? We are focusing only on districts with the decorative pedestrian lamp posts. In the future, we'll look into options for the arterial districts (Madison, Roosevelt and North). 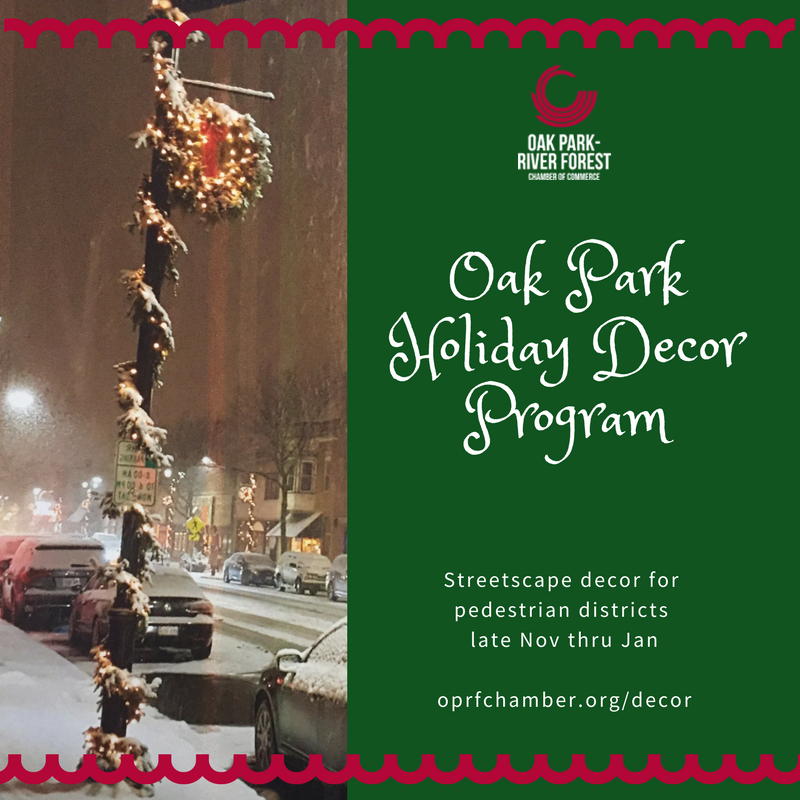 Downtown Oak Park has its own holiday decor program, funded through its SSA property tax assessment. When will they be installed? McAdam Landscaping will install the decor in mid-to-late November. When will they be taken down?